The eurozone crisis, weak domestic economies, volatile financial markets and regulatory uncertainty – all these factors undermined investor confidence, leading to fewer mergers and acquisitions around the world in 2012. Despite these circumstances, Canada has weathered the storm. 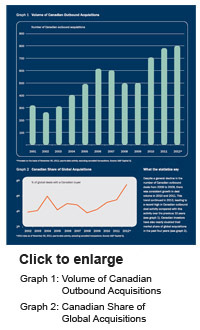 The figures show that Canadian global acquisition activity is at its highest in recent history. As Canadian investors continue to pursue international deals, they will undoubtedly face challenges – such as expropriations, fiscal concerns and litigation - and will focus on mitigating risk as they transact abroad. To a large extent, the destination of Canadian outbound investments is a business choice driven by the organization's strategy. Our clients say that a variety of factors influence their investment decisions. For example, Brookfield Infrastructure has been expanding its operations in regions where the right businesses are available at the right price. According to Sam Pollock, CEO, a focus of Brookfield Infrastructure is to invest on a value basis so that there is a greater margin to absorb error. These are typically transactions they describe as multifaceted situations. Having "margin safety" is particularly important when the company enters a new market, which presents a greater likelihood of surprises. In addition, given Brookfield Infrastructure's approach to capital investments, another key consideration is whether debt financing is available in the local jurisdiction on acceptable terms. For Scotiabank, earnings growth and favourable demographics, such as a youthful population, are important considerations. However, the bank weighs these opportunities against geopolitical and social risks in a particular jurisdiction. Acquiring a toehold that can be further developed over time is one way for the bank to enter, and become familiar with, a new jurisdiction. In these circumstances, Dieter Jentsch, Group Head, International Banking at Scotiabank, says that the bank should have the option of increasing its stake if an opportunity arises. For the Canada Pension Plan Investment Board (CPPIB), pursuing diversification opportunities abroad is an essential part of its strategy. CPPIB's global presence means that it is constantly invested in public or private markets across a number of jurisdictions. Andre Bourbonnais, Senior Vice-President and Head of Private Investments at CPPIB, says it is not a question of should but when CPPIB will be in a particular jurisdiction. And it will base its investment choices on whether better (and more value-added) returns can be generated from the private or public markets in the jurisdiction in question. In some instances legal factors will also be relevant in picking an appropriate jurisdiction. For example, for Brookfield Infrastructure, the legal considerations weigh heavily in its decision matrix, given the nature of its highly regulated longlife assets. Its approach, similar to that of an underwriter, will be to spend a considerable amount of time performing due diligence on the regulatory framework in an overseas jurisdiction and understanding the related risks before entering the market. There are a number of legal factors to consider when deciding whether a particular jurisdiction is suitable to invest in. Considering these factors will also help mitigate the risks associated with pursuing an international transaction. The first step will be to assess the extent to which the local legal and judicial systems are developed and the flexibility of local laws. This will influence not only the decision whether to invest in a given jurisdiction, but also the decisions regarding the form of the investment, the length of the investment, what partners will be chosen and when to exit. Another important issue at the planning stage will be to understand how disputes are resolved, whether contractual rights can be specifically enforced and how the remedial regime generally functions in the jurisdiction. For some investors, the jurisdiction's legal culture, such as whether there is a culture of compliance or an established court system, will determine whether or not they enter that market. In most cases, the ability to enforce property and contractual rights will be crucial. Factors such as speed, reliability and local recognition and enforcement of judgments and arbitral awards will also guide the investor's choice of adjudication and dispute resolution. A further consideration is stability of the tax regime and the potential for achieving overall tax efficiency in respect of financing the overseas investment, ongoing cash flows generated from the investment and the related flow-through tax treatment. Equally, and possibly more important, a significant concern will be the ability to exit the investment, repatriate the invested funds and returns, and manage the impact of exchange rate fluctuations. Many investors believe that having a local partner in the overseas jurisdiction is desirable or, for political reasons, a necessity. For CPPIB, having the right partner to pursue a direct investment is essential, given its co-sponsorship model for sourcing investment transactions outside Canada. For the board, performing due diligence on its co-partner in these circumstances is an entirely separate, but critical, workstream, and the exchange of information between the fund group and the direct investment group is key. Mr. Bourbonnais says, "'Due diligencing' your partner to make sure you have the right one is as important as, if not more important than, due diligencing the deal itself." For Scotiabank, because it typically buys its businesses gradually, it is critical to first become comfortable with the current owners and managers, who will continue to be key partners for the foreseeable future. Mr. Jentsch has found that the best way to perform due diligence on a business and its owners and managers, and also test the organization's tolerance for risk, is to "send people in the business to assess the business," rather than relying only on accounting and legal teams to do this. Even if it is possible to go it alone, it may not be the likely route to success, particularly in markets where the investor is not well known. In some cases, even our most popular Canadian investors may not be welcome when they acquire a business abroad. Mr. Pollock believes that, although this may be a worn-out phrase, there is value in becoming a partner of choice in an international transaction and that developing strong local relationships may pave the way to a successful transaction. He explains, "Being the unwanted buyer on a domestic deal is always tough, and it's even tougher to go into a foreign jurisdiction on an uninvited basis. Your chances of success are very low and you are probably heightening your risks substantially. I think you should either have a local partner or make sure you are the party that is wanted and not the party that is invading the territory." At the deal stage, the focus on mitigating risk will normally shift from macro considerations to risk issues related to the transaction itself. It is important to manage expectations internally with regard to the overseas transaction. The outcome may be less predictable than in domestic deals, and parties may not necessarily be afforded the same legal protections that they are familiar with. The documentation style and approach can also vary significantly from the North American look, feel and substance that the deal team is normally accustomed to. And in Mr. Bourbonnais's experience, due diligence standards can differ widely. For strategic purposes, parties should not overlook the need for consistency in their approach on the international deal with the organization's overall approach in that particular jurisdiction. For example, an international transaction will often require special regulatory approvals, such as foreign investment review, sector-specific consents and competition clearance, over and above those normally needed on a domestic deal. In obtaining these approvals, investors should make sure that their stance on a particular deal does not compromise the outcome of other pending transactions or other positions taken with regulators in the same jurisdiction. Mitigating risk relating to an overseas investment does not end once the transaction is completed. A broader question is whether the organization will be comfortable operating in the particular jurisdiction, given local customs and practices. From an operational point of view, integration issues can be considerable, depending on the jurisdiction, domestic practices and whether the organization already has a local presence. For these reasons, Anita Mackey, Vice-President & Associate General Counsel at Scotiabank considers it important to conduct post-acquisition reviews in order to manage post-closing risks, smooth the transition process and ensure that the transaction is ultimately a success. For CPPIB, the best way to facilitate integration is for foreign employees to spend time at their head office and for head office to send "culture carriers" to overseas establishments. Integration must be done carefully, without disempowering the local management team; but if done well, it will help the teams in both regions to better understand the cultural and business diversities and find common ground. Mr. Jentsch also emphasizes the importance of growing into an international role slowly, so as to adapt to the local culture and practices while maintaining the organization's own culture and values. He states, You need to be a good corporate citizen in the local jurisdiction, understand the local culture and adapt to it, at the same time as watching out for growth prospects. But in my view, you can't be brazen about pursuing opportunities – it takes years of experience." A significant overseas risk in certain jurisdictions is liability for bribery and corruption, as well as risks regarding economic sanction regimes, export controls and antiterrorism requirements. In our experience, effective diligence at the front end can help mitigate and manage those risks, but organizations will also need to establish policies, provide ongoing employee training and conduct regular reviews to mitigate those risks after closing. Mitigating these overseas risks is not only about protecting the international investment, but also about protectingthe integrity and reputation of the organization. The damage to reputation from irregular business practices or even conflicts with employees or within the community can be just as potent when arising from a foreign jurisdiction as from damage caused closer to home. As Canadians continue to engage in global M&A and other investment activity, some investors will encounter obstacles and may get too close to the steamroller. We expect that weighing the risks associated with an international pursuit against the potential for financial reward – and mitigating those risks – will continue to be the focus in the year to come.